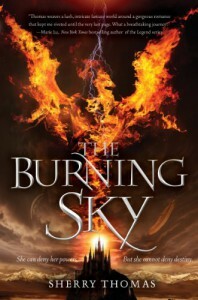 I’m a big fan of Sherry Thomas’ historical romances and when I heard she wrote a YA fantasy novel, The Burning Sky, I wasn’t sure what to think other than express concern that may she be walking away from historicals. Then I read the synopsis and couldn’t wait to read it! It was everything I had hoped it would be and so much more! Prophecy states that a great elemental mage will one day save the realm from Bane, a powerful mage. Iolanthe Seabourn has heard the stories and when she’s told she’s the one prophesied, she’s not sure what to believe. It’s Prince Titus of Elberon who comes to her rescue when her attempt to fix a batch of elixir goes wrong when she summons lightning. Titus knows the streak of light signifies the start of the prophecy, but Iolanthe is unaware and soon her life is in danger. He takes her to Eton and there begins to prepare for the upcoming battle. Soon Titus is summoned to the Inquisitor’s chambers and there he fights to stay alive and protect Iolanthe’s life. Character development is strong. Titus reminds me a lot of a hybrid of past Thomas heroes, mainly Leo/Fritz/Camden. Titus comes off older than his sixteen years and it’s because he has a lot of responsibility. The most important is keeping Iolanthe alive so she can become that great elemental mage. He’s also spent his entire life training for the moment that would be the beginning of destiny. He does keep others at arm’s length and comes off as slightly arrogant. One of the biggest complaints I hear in YA is that a female character often has this great task of saving the world and not knowing what to do or being meek about it. Iolanthe reminds me a lot of Theodora and yet not the Theodora we see in Private Arrangements, but one she could have been. Unlike Theodora, she’s strong and willing to take her future into her own hands. Her only weakness is not having developed her full powers. With Titus’ assistance she slowly blossoms and accepts the job at hand. We have a wide cast of secondary characters. There are a lot of references to the Inquisitor and how powerful she is, but in reality it’s Bane that everyone is worried about. I loved the boys at Eton, particularly Titus’ cousin Wintervale and fellow classmate Kashkari. The writing is engaging and it’s a fast paced read. Thomas does a phenomenal job with the world building. We have two worlds, basically London in 1883 and an alternate world that has the kingdom of Atlantis. The late Victorian era is Thomas’ specialty and if you’ve read her historicals, you’re familiar with the setting. Eton plays a major role as the backdrop since Titus takes Iolanthe and disguises her as Archer Fairfax. I adored the banter between Titus and Iolanthe! Most girls would probably be in awe if a prince was standing in front of them, but not Iolanthe. I really enjoyed the friendship they formed and how they came to trust each other. I know a few people might find Titus’ love for Iolanthe a little creepy especially since he uses her image in a simulation, but he’s in awe of her and if she’s the one that’s been prophesied then it makes sense that he would use a likeness of her. I do have a confession regarding the writing. I worried about the tone because the first 100 pages or so didn’t sound like Thomas, but then as I continued to read I could see aspects of her writing. It does feel like she wrote this for her children. There’s nothing wrong with that, but I do hope they enjoy it. Fans of Thomas’ historical romances with teens will have a great series to read together and bond over. My only big compliant is people comparing it to Harry Potter. I think it does a disservice to Thomas when people are expecting it to read like HP and it doesn’t. For those who have started The Burning Sky and have given up because “it’s too confusing,” I ask you give it another try. Everything will become clearer once you get past a few hurdles. I know a few people have brought up concerns regarding how The Burning Sky begins and some believe there were parts included that were unnecessary. Knowing how Thomas writes, I know she doesn’t add things without a reason and while it not apparent right away, trust me when I say she will address some of these concerns in either the second book or the third. It’s all tied together. Ah, I just adore Thomas’ The Burning Sky! It has magic, adventure, and a little bit of romance. It was delightful read and I never wanted it to end. I have theories regarding Bane and ah, I just can’t wait to read the rest in the series. Unlike other trilogies, this one doesn’t end in a cliffhanger! Huzzuh! If you’re a fan of fantasy or are in a reading slump, I highly recommended Sherry Thomas’ The Burning Sky. If you’ve fallen in love with it and are interested in reading her historical romances, Private Arrangements, Not Quite a Husband, His at Night, and Ravishing the Heiress are my favorites.